In October 2010, Bing got something Google couldn't get, a partnership with Facebook to access Facebook data and incorporate that data into Bing results. 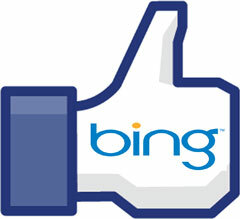 The deal was, Bing barely used that Facebook data. So then in February, Bing added more integration with Facebook but still did not fully use Facebook data to personalize the search results. That has changed as of yesterday when Bing announced a whole new level of Facebook integration into their search results. Bing search results can now be very tailored to your Facebook profile based on your friends and even the collective Facebook network (not your Facebook friends). (1) Showing which of your friends liked the search results given by Bing via Facebook and Bing will promote the results that are liked by your friends to the front page of the Bing search results. (2) Bing is also bringing forth very popular pages based on global Facebook 'Like' data and even showing anonymous messages from Facebook users on the Bing results under those results. (3) Bing is also making it easier to go to Facebook after seeing a search result to have a "conversation" about that search query. They are doing so by expanding the Facebook Profile Search, within Travel Wish List , they are showing Friends who live there and making it easier to share results on Facebook. Also, you can now Like things on Facebook via the Bing Toolbar. For more details, see the Bing Blog.